Bought this one (several years ago) for the title. And the author’s name. Of course I did. I also bought it because it had this wonderful pulp adventure cover image (even though, as my artist wife has pointed out, the anatomy is off; nobody’s torso actually bends like that), and because the story seemed pretty pirate-y. 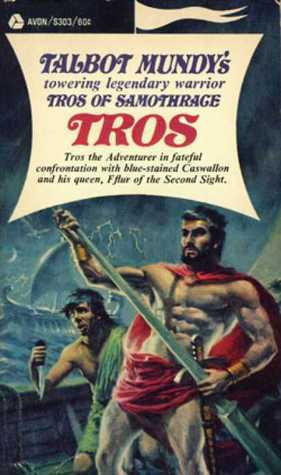 The hero, the almighty Tros of Samothrace, is a sailor by nature and inclination; the story is partly about his pursuit of the perfect ship, which he speaks of building more than once; and it also tells the tale of Tros sailing with a British crew and thwarting the invasion of England by Julius Caesar himself, which I thought would be interesting. It was. This is the second time I’ve read this, because after the first time (And I genuinely can’t remember if I reviewed this book then, but since I can’t find the review to confirm it, I figured I might as well give it a write-up) I went back to Powell’s City of Books (Just about the only thing I miss after moving away from Oregon) and bought all four sequels; I wanted to read them again now, and so I re-read Tros so I could remember the story and characters before I read Helma, the second book. Which I have now read, and enjoyed, and will review in a few days. This book held up well to a re-reading; better than most pulp adventure books. Part of that is because the character really is delightful; Tros, apart from his epic name (which I absolutely love and can’t resist saying with maximum emphasis every chance I get — “Tros! Of! Samothrace!”), has a great blend of brooding violence and anger, mixed with a life-loving, laughing vitality; he goes straight from cursing at a storm to laughing at the wind as it blows rain into his face, and it makes it a hell of a lot of fun to read his story. Another part of the quality of this book is the historical aspect: Mundy wrote a book that very well could describe what it was really like to face off against Julius Caesar. The descriptions of the character – who does appear in the book, holding conversations with Tros as well as meeting him in battle on land and at sea – seem pretty well in line with what I know about the man himself; Mundy doesn’t change history or Caesar in inserting Tros into his story. Caesar is still the unbeatable general who has at this point conquered all of Gaul; Tros only manages to get the better of him by taking advantage of Caesar’s weak points, and he frequently has to work hard to evade getting steamrollered by Caesar at his strongest. Mundy does it very well. The historical setting, the Anglo-British tribesmen whom Tros allies with, and the druid/mystic religion that Tros shares with the people of Britain, are all quite interesting and well done. But really, this is a pulp adventure novel like Conan or Allan Quatermain; Tros is a good pulp hero, Caesar makes a fantastic villain, and the adventure is mighty fun to read. Definitely recommend.